Last week we had a bit of a cold snap. Given that it was the first one of the winter, I wasn't even close to being bored enough to brave the temperatures. So what better way to feel warm and cozy than to throw something in the slow cooker to simmer away the whole day? Several years ago, I got a subscription to Taste of Home from my mother in law. To this day, it remains one of my favorite cooking magazines. I find at least one "keeper" in every magazine that makes it into my old school recipe box. There would probably be several if I tried more of them! 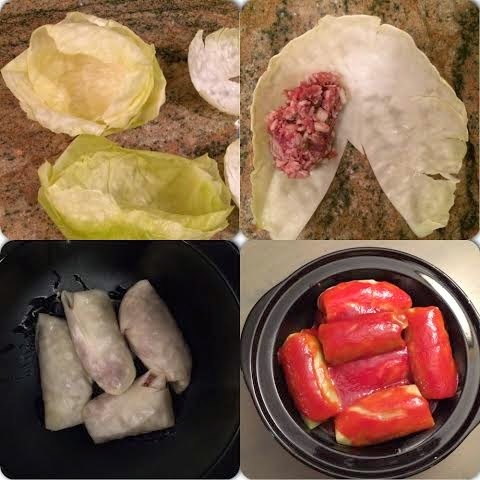 This cabbage roll recipe was one of the first ones I tried from the magazine. 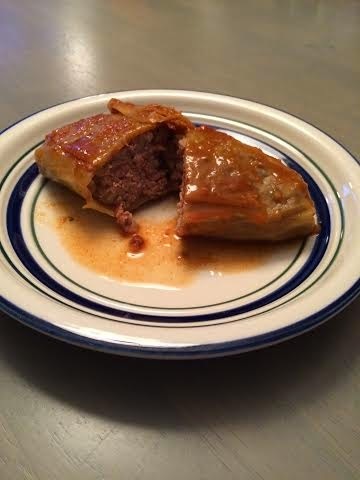 Here is the link to the original recipe, "Sweet & Tender Cabbage Rolls", which I've adapted with very slight changes below to suit my tastes. (I ditched the mushrooms because the thought of canned mushrooms in this sicked me out. Then I tweeked some quantities). First, cook the cabbage in boiling water just until leaves start to fall off the head. (I recommend having a really good set of silicone oven mitts for digging it out of the water, or use some sort of meat forks). This step is a great place to scald your fingers and lash out with obscene language. Let it cool until it's easy to handle, and then slice the bottom off to make it easy to peel the leaves. It wasn't until I'd made these about 3 times that I really mastered this step. Be patient while peeling the layers. A couple rips in a slice are ok, but try to keep it to a minimum so you can easily roll them later. Peel about 12-15 leaves off, and cut out the thick vein, making a v-shaped cut. In a large bowl, combine all the ingredients and mix very well with a wooden spoon. Place about 1/2 cup on each leave, and overlap cut ends to fold in sides. This isn't something you can really explain....you'll realize what I mean when you try. Just try to roll up tight and cleanly to completely enclose filling. It takes a little work. My first couple batches weren't even close to beautiful. Lightly coat a 4 or 5 quart slow cooker with cooking spray. Layer the bottom with a layer of rolls (mine holds about 4-5 on the bottom). Cover with a layer of sauce (which I just whisk together in a large measuring cup). Repeat layers and sauce until you've used up all your rolls. Cook on low for 7 to 8 hours, or until very tender. The original recipe says to make sure a meat thermometer reads at least 160. That's ridiculous because if your cabbage rolls aren't AT LEAST that hot after 7 to 8 hours, then you should toss your throw cooker in the garbage. It's broken. DO NOT SKIMP on the cooking time, or your cabbage will be tough and not the melt in your mouth, sweet-tomatoey-smothered way that it should be. Don't think you can wing it on high in the afternoon for a 6 pm supper. I've tried it. Fail. Low and slow. Low and slow. Finished product. This picture doesn't really do it justice as I forgot to take a pic and this is a cold leftover.